We have restored many historic homes in both Boston and Suburban cities. 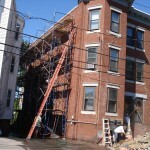 Our specialty is complete masonry restoration, brick pointing and repairs. See below the most recent jobs done, feel free to contact us anytime using our contact form. This was a total brick repointing and inspection done on this historycal building. Local: 12 Whitby Street in East Boston, MA. This Job was done in 05 days after the building inspection approval. Click Here to See more Pictures and comments.